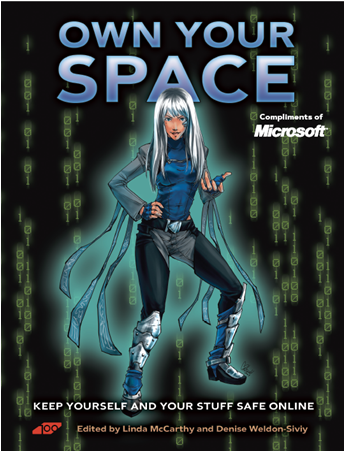 Own Your Space – Keep Yourself and Your Stuff Safe Online is an insightful book written by long time security and safety expert Linda McCarthy and offered free to consumers through the generous support of Microsoft. Written for computer and Internet savvy “tweens” and teens specifically, this book is also a useful resource for the adults they rely on. This book will help teens ‘own their space’ online. Hackers and Crackers, Taking SPAM Off the Menu, Cyberbullies, Phishing for Dollars, Safe Cyber Shopping, Browsers Bite Back, Private Blogs and Public Places, Going Social, Friends Creeps and Pirates, Any Port in a Storm, Look Pa, No Strings!, Getting Help, Tweaks, and A Note to Parents. This entry was posted on Tuesday, September 14th, 2010 at 10:17 am and is filed under Linda's Blog. You can follow any responses to this entry through the RSS 2.0 feed. Both comments and pings are currently closed.